This recipe makes some of the best chocolate cupcakes you will ever have. Spencer whipped them up yesterday (with a tiny bit of help) and they cured my chocolate craving. 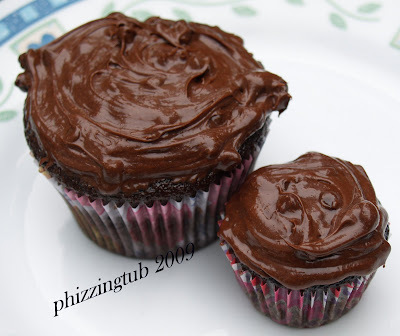 These cupcakes were moist, the right amount of chocolate, not overly sweet and simply perfect. Spencer does not like items that are really sweet but he absolutely went wild over these! The recipe came from Hershey's Kitchen.com, which is packed with wonderful recipes that will have you baking up a storm. I have to admit that we did not make our own frosting but opted to use Betty Crocker Triple Chocolate Fudge Chip. Check out Hershey's Kitchens for more yummy, perfect, chocolate recipes to enjoy. Heat oven to 350. Grease and flour two 9 inch baking pans. Stir together sugar, flour, cocoa, baking powder, baking soda, and salt in large bowl. Add eggs, milk, oil and vanilla; beat on medium speed of mixer 2 minutes. Stir in boiling water (batter will be thin). Pour batter into prepared pans. Per Serving (excluding frosting): 124 Calories; 4g Fat (30.3% calories from fat); 2g Protein; 21g Carbohydrate; 1g Dietary Fiber; 14mg Cholesterol; 168mg Sodium. Exchanges: 1/2 Grain(Starch); 0 Lean Meat; 0 Non-Fat Milk; 1 Fat; 1 Other Carbohydrates. Cupcakes: Line muffin cups ( 2 1/2 inches in diameter) with paper bake cups. Heat oven to 350 degrees. Fill cups 2/3 full with batter. Bake 22-25 minutes. Cool completely. Frost. About 30 cupcakes. One-Pan Cake: Grease and flour 13x9x2 inch baking pan. Heat oven to 350 degrees. Pour batter into prepared pan. Bake 35-40 minutes. Cool Completely. Frost. Three layer Cake: Grease and flur three 8 inch round baking pans. Heat oven to 350. Pour batter into prepared pans. Bake 30-35 minutes. Cool 10 minutes; remove from pans to wire racks. Cool completely. Frost. Bundt Cake: grease and flour 12 cup Bundt pan. Heat oven to 350 degrees. Pour batter into prepared pan. Bake 50-55 minutes. Cool 15 minutes; remove from pan to wire rack. Cool completely. Frost. We have just added your latest post "Perfectly Chocolate" Chocolate Cake" to our Food Directory . You can check the inclusion of the post here . We are delighted to invite you to submit all your future posts to the directory for getting a huge base of visitors to your website and gaining a valuable backlink to your site.